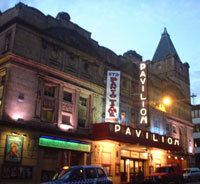 Glasgow's Pavilion Theatre is one of Glasgow's oldest theatres, having opened its doors for the first time in 1904, and has remained virtually unchanged. The Pavilion presents a range of entertaining shows, comedy, music, plays and pantomines all year-round. It is located on Renfield Street in the centre of Glasgow, just next to the Cineworld multiplex and minutes from Sauchiehall Street and Buchanan Street.